RESEARCH to provide insights into child and youth mental health is a career goal for Bundaberg's Georgina Lamprecht, who graduated this week from USC with First Class Honours in Occupational Therapy. Ms Lamprecht has begun work as an occupational therapist with the Education Queensland in Bundaberg, supporting primary and secondary school students who have a verified disability. The 21-year-old, who received a USC Medal for Academic Excellence at the graduation ceremony, said her Honours thesis on healthcare workers' understanding of mental illness in Vanuatu had fuelled her interest in postgraduate research. Last year she completed a seven-week USC placement working with Medical Santo, a not-for-profit medical aid organisation providing health services in the South Pacific nation. She investigated perspectives on the cause, diagnosis and treatment of common mental health conditions in Vanuatu, which formed the basis of her thesis. "I aim to have a paper on my research published sometime this year and I am excited to present my findings at the Occupational Therapy Australia National Conference in July,” she said. 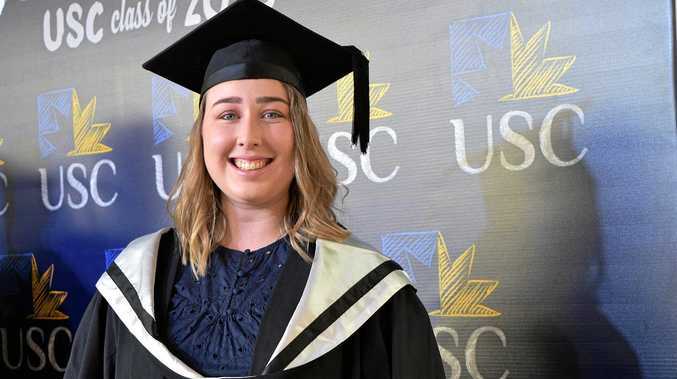 USC's Medal for Academic Excellence was one of many honours for the former Shalom College student, who graduated with a Grade Point Average of 6.6 out of a possible 7. Last year, her undergraduate research and academic achievements were recognised with a student award by Occupational Therapy Australia. Ms Lamprecht's inspiration for becoming an occupational therapist came from her mother, an OT with Education Queensland and her aunt, a teacher who works with children with autism. Working in paediatrics over the past few months had further increased her interest in child and youth mental health. "The most rewarding aspect of my new job is getting to know so many resilient school students who continue to strive to do their best despite facing many challenges,” she said. Ms Lamprecht said there were areas in occupational therapy that could benefit from more evidence-based investigation and she hoped to conduct PhD research that could inform practice, policy and education.